For years, a collection of nondescript boxes languished in a storage room at the now-shuttered Riverside Metropolitan Museum (RMM). Brought to Southern California from Mexico by the museum’s former anthropology curator Christopher L. Moser in the 1950s and ’60s, the boxes were bequeathed to the museum upon Moser’s death in 2003 but remained mostly undisturbed until 2015. That was the year Catharina Santasilia peered inside — and discovered an unlikely portal to a 3,000-year-old Mesoamerican village. Santasilia, an anthropology Ph.D. student specializing in archaeology at the University of California, Riverside, had stumbled upon a significant collection of ceramic figurines and vessels produced by the Tlatilco people, an ancient community whose members lived on land that’s now buried beneath Mexico City’s urban freeways and factories. Dating from 1200 to 900 B.C.E., the ceramic figurines she uncovered will be given new life during the Feb. 3 opening of the first-ever RMM-partnered exhibition to land at the Riverside Art Museum (RAM): a showcase of 34 of the Tlatilco figurines found in RMM’s archives, plus 20 supplementary pieces borrowed from the Los Angeles County Museum of Art and the Smithsonian Institution’s National Museum of the American Indian. The artifacts on view in “Uncovering Ancient Mexico: The Mystery of Tlatilco” share some aesthetic similarities with the baby-faced pieces made by the Olmec people, a neighboring civilization that was located a few hundred kilometers from Tlatilco. But unlike the Olmec, Maya, and Aztec civilizations, little is known about the Tlatilco people — a disparity Santasilia partially attributes to their lack of written materials and monumental architecture. Santasilia, the exhibition’s first-time curator, spent a year and a half crisscrossing North America to compile archival research for her dissertation and source loaned pieces from museums with Tlatilco collections. 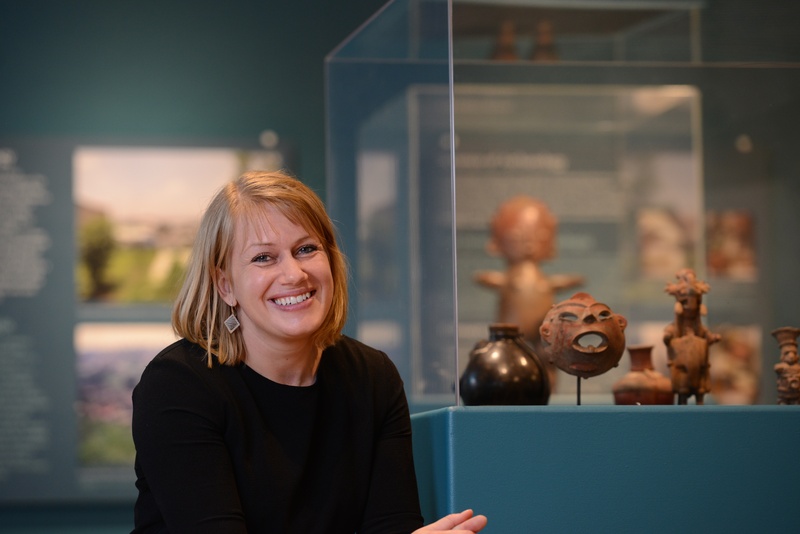 Funded by the University of California Institute for Mexico and the United States, the native of Copenhagen, Denmark, visited more than 15 top-tier museums, including New York’s Metropolitan Museum of Art, Harvard University’s Peabody Museum of Archaeology and Ethnology, and the Princeton University Art Museum. Her research yielded a portrait of a long-underappreciated culture. Beginning in the 1930s, the first of roughly 600 Tlatilco burial sites was uncovered by brick workers. At the time, the region was known for its high-quality clay soil, but the discovery quickly attracted seekers of a different kind of resource. In 1942, Covarrubias initiated the first of a handful of controlled archaeological excavations of the Tlatilco site. But by the late 1960s, the site had been fully developed over to accommodate Mexico City’s rapid growth and now rests below a sprawling metropolis, according to Santasilia. Attendees of the exhibition, which runs through Dec. 30, 2018, will encounter drawings, previously unpublished historical photographs, three-dimensional replicas, and a video collaboration with the Los Angeles-based company Night Fire Films in which 218 still images of Tlatilco figurines morph into one another, bringing them to life through animation. Coinciding with the exhibition’s opening on Feb. 3, the Riverside Public Library’s downtown Main Branch at 3581 Mission Inn Ave. will host a free symposium sponsored by UCR’s Center for Ideas & Society. The single-day conference, titled “The Rise of Civilization in Mesoamerica,” is open to the public and will include presentations from 12 anthropological researchers and scholars working in various corners of North America, including keynote speaker Karl Taube, a UCR anthropology professor and Santasilia’s advisor. The Riverside Art Museum is located at 3425 Mission Inn Ave. General admission is $5 ($3 for students and seniors with ID, and free for children under 12). Metered street and lot parking is available along Mission Inn Avenue. Parking is free on weekdays after 5 p.m., and on weekends and holidays.